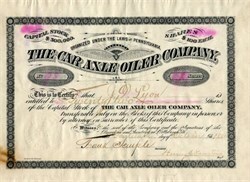 Beautiful certificate from the Car Axle Oiler Company issued in 1884. This historic document was printed by the Otto Krebs Lith. Company and has an ornate border around it with company header. This item has the original signatures of the Company’s President, and Secretary, and is over 128 years old. Paperclip stain on left margin.